This Briley fore end cap for the Beretta Urika, Teknys, and A400 models is manufactured out of 17-4 Stainless Steel and 6061 Aluminum. 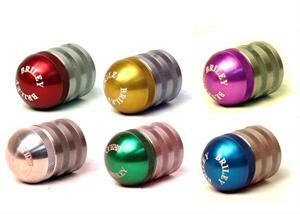 It is close in weight to the factory cap and the aluminum section is available in assorted colors. The cap is specifically designed to be disassembled so as to be cleaned. The Beretta fore end cap is prone to accumulating carbon and powder residue which in the long run will cause it to seize. It is recommended that they are regularly opened and cleaned. Simply unscrew and separate the two sections. Remove the spring and retaining washer, clean and re-assemble. Additional heavier weights can be bought separately to replace the aluminum section.